Everyday I am reminded of going green and how our land fills are quickly filling up or full. Anticipating the arrival of our newest addition to the family makes me look at my "footprint" I leave behind. I would love to say I'm switching to cloth diapers, but honestly I can't do it. However there are other ways we can help! Many cities on my state (Washington) have started imposing some pretty interesting rules or laws to force residents to go green. For instance, Seattle forces residents to recycle curb side or they get charged more for garbage pick up. Their newest GREEN law tells residents that they have to use reusable grocery bags or pay a $.10 per bag tax. So first let me comment I agree with this law to a point. Yes we should use reusable bags (if we can remember them) but the $.10 tax should go to the store who has to pay for the plastic or paper bag not the city government. Okay so onto my point for the day. I have found a great product that will help me go green in everyday life and also doubles as a baby/toddler toy. 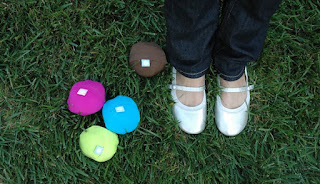 What a great accessory for any diaper bag! Flip and tumble bags go from a ball to a bag in seconds! Now I'm not saying you should let your child play with this or chew on it unsupervised because it is not intended to be a true child toy. But if you are grocery shopping and you child is starting to get antsy give them a Flip and tumble 24/7 bag and let them squish it or toss it! And when you get to the check out help them turn it into a bag and fill it with your purchased goodies. Also when you have a little accident and never seem to have a bag around pull this handy dandy bag out of your diaper bag, which really takes up less space than your cell phone and place dirty contents in it. Bags are machine washable and hang dry! So many of your may be asking what's different about this bag or why should I use it. Simple, I have TONS of reusable bags. Many of them reside in my car. But when it comes time to check out guess what I've left them in the car. This bag seriously can fit into your purse, diaper bag or pocket so should you choose to do so. I have a very tiny purse but it fits in mine just perfectly. It also doubles as something to keep Little Man out of trouble in the store. Some times I will even give him products to put in his bag. When we get to the checkout he empties the bag and then fills it back up and helps carry it into the store. One lucky winner will win one 24/7 bag. To enter comment on how you will use your 24/7 Flip and Tumble bag. Entries will be accepted through February 15, 2009 and I will pick the winner using Random.org. US readers are only eligible. Make sure you leave an email address in your comment or that you have one accessible on your blog so you can be contacted if you win! I will also list the winner on PRIZEYwinners so if you are a subscriber to PRIZEYwinners you do not need to leave your e-mail address. If you do not send me your mailing address within one week of notice of winning I will give your prize to someone else. 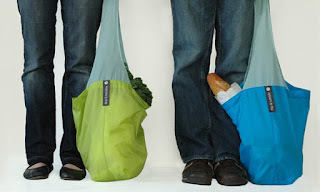 I'd use the 24/7 Flip and Tumble Bag for my shopping at grocery stores and Walmart. I would use this at work where we are constantly searching for a bag to carry giveaway prizes from one facility to another. this would be perfect to always have in my desk. Thanks! I would use the 24/7 when we go shopping or like a mini bag to keep my daughters things in when we go out. Thanks. This looks really big! It would be great for shopping at "club stores"
So many uses! Taking all my son's toys with us, grocery shopping, heck - even transporting laundry! What a cool bag, I have never seen this before! Thanks for the write up! I would use my flip and tumble bag for the grocery store and probably as a catch all for all of my stops vs a bag at each one...take to the car and toss in! I teach. I'd use it at school to bring home extra papers and I'd use it for grocery shopping! i can think of a bunch of ways i'd use this bag: for shopping, for the kids to carry their stuff when they go overnight to the grandparents each weekend, for keeping in the car so i'd have a bag on hand are just a few. I would use it for grocery shopping at library books!! What a fun bag. I would use it to go to church and girlscouts when my purse and reg bag just does not cut it!! I'd use it while grocery shopping, more room tob uy more things! I'd use it for groceries - simple, but it works so well. I'll be using it for grocery shopping! I am always forgetting my bags when I run into the grocery store. This would enable me to have a re-usable tote bag with me at all times. I'd use this for the Farmers Market in the summer. Thanks for entering me. I would use this to replace some of my worn chico bags. My bags see a lot of use. They get hauled from grocery store, Target, Walmart, various boutiques, snack bag for day trips, car trips and storage bag for craft projects. I never seem to have enough to go around. I will use this bag as a grocery bag, Wal-Mart bag & a bag that I can throw books & toys in for my son before going out to eat. I will use it shopping so that I can help protect the environment by avoiding using plastic throw away bags! I would use this for all my grocery shopping. For my commute! Shoulder bags are a necessity for the train. I'd use this at the market! I would use this for running errands: going to the library, small grocery trips, going to the Post Office. i would leave it in my glove compartment so i would always have a bag when i need it...like at the store! I always remember to use my reusable bag for groceries, but forget at other stores. I'd use it for when I'm shopping at stores like Target, or at the mall. I would carry it everywhere ! I always seem to acquire to much to carry!! Oooh, that would be great to throw in my purse for the days I forgot all the other bags. Small enough that I could forget about it, but holds enough for a quick trip to the grocery! I would keep it in my diaper bag for when I need an extra bag to carry things in. . .or for my daughter to "fill"
I would use this for shopping. All kinds of shopping! I love that I can also use it to occupy my dd while shopping. Great bag! Thanks for the giveaway. It would be perfect to keep in the car so it would be there for those unplanned shopping stops. I would use this daily for bringing stuff to work or for transporting some of my kids stuff to daycare or Grandmas. I'd love to try it for grocery shopping but I'd need lots of them because I buy tons of groceries at one time. :) Thanks for the opportunity to win! i would use this everytime i went grocery shopping:) thanks! I would also love to have this to carry in my diaper bag for those times when I need an extra bag. It would definitely come in handy when I bring my 2-year-old and 8-week-old to the library and don't have a free hand to carry the books or when we go to the grocery store so we don't bring home more wasted bags. I'd use it for grocery shopping. . .and probably a lot of other things! I would use it to go grocery shopping. I really want to get into the habit of bringing my own bags when I shop. I'd use it for all my shopping and as a tote bag when I'm not shopping. The flip and tumble would live in my purse and be pulled out and used any time a bag is necessary. Library, grocery store, bringing items in from the car, impromtu diaper bag you name. Mailing packages and grocery shopping for starters! I could use it to carry my stuff to work. I would use it for groceries, or whatever else it could come in handy for (which is LOTS with five young children). I'd use it on car trips to throw things in! Will use it for all my little misc. errands, for groceries and in the diaper bag!